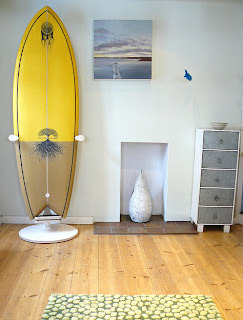 You need a place to store your surfboard? You don't feel like getting out your tools and drilling into your nicely painted walls? What you need is a surfboard stand! This type of surf rack makes it easy to both store and display your surfboard. With the size of a surfboard, it can be a hassle to hoist the board to the wall each night when returning from longs hours spent in the surf. But StoreYourBoard has another solution: Free Standing Surf Racks. This particular kind of rack is the perfect if your living space is limited and also leaves your walls screw-free. Free standing surf racks can also easily be moved when it comes time to board up the beach house or rearrange the furniture. 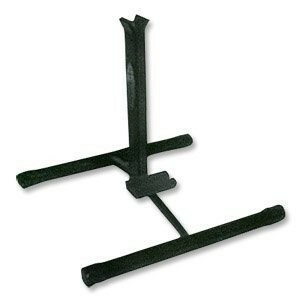 This free standing surf rack does not require a center fin to secure your surfboard. It is cradled by the rack to allow easy removal and placement. You can display your surfboard in this rack with or without fins. 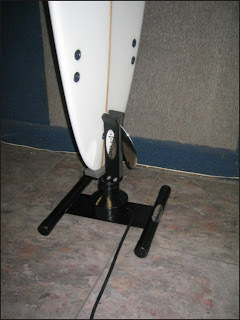 This surfboard stand uses the center fin of your surfboard as a way to secure the board and firmly hold it until your next set. StoreYourBoard’s Center Fin Surfboard Stands feature a padded lip where the base of your board rests while the center fin holds it vertical. Pretty simple rack that does a nice job holding your surfboard. StoreYourBoard also offers a special free standing rack that holds surfboards both with and without fin, the Surfboard Floor Display Stand. However, in order for it to hold a surfboard with a center fin, the board needs to be placed in the stand with the fin facing out. This stand has an adjustable mechanism that squeezes the sides of the board as its weight is applied to the bottom of the stand. As soon as you lift up on the surfboard the sides release and you can easily take your board out. This rack creates a very nice visual display. The surf rack is made from high quality wood and would be a great rack to showoff your favorite surfboard in your family room, office, or wo/man cave. One thing to keep in mind is that these free standing racks have height limitations. But no worries - we offer surfboard wall racks that are sturdy and allow you to hang longboards and multiple surfboards.